What's ooey and gooey and crunchy all at the same time? 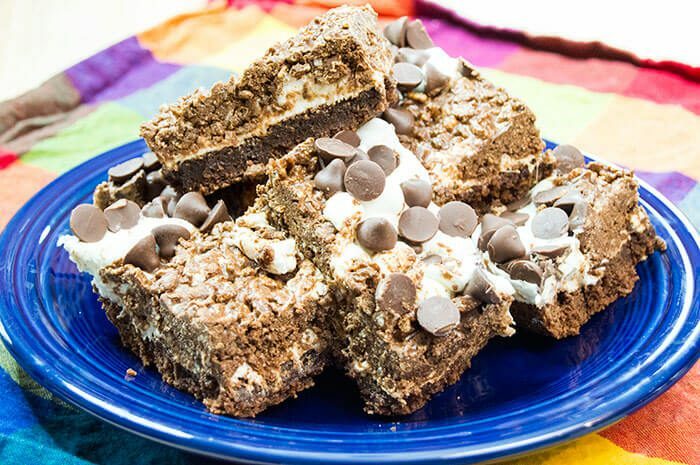 Marshmallow crunch brownies, of course! Made with a brownie base, an oozing marshmallow center and peanut butter crunchies on top, these brownies are something to die for - making them literally, killer brownies. 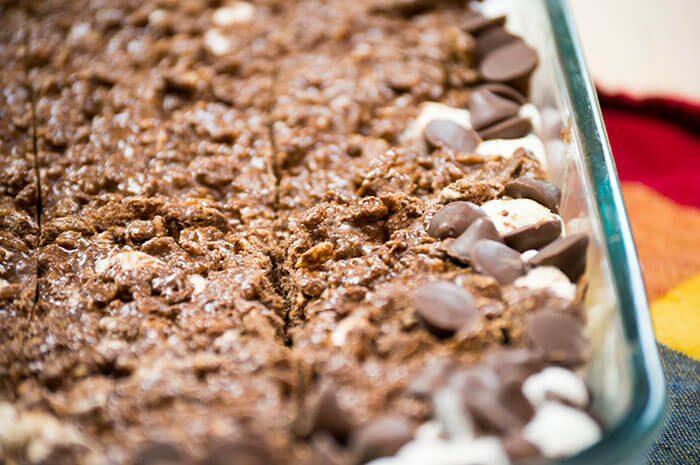 As an added bonus to my brownies, I found some peanut butter filled chocolate chips to spread around the top of my brownies, but feel free to use your favorite chocolate chunks or even a chopped up candy bar to take this dessert to a whole 'nother level. These brownies make any day spectacular and easily 10x more delicious! Preheat the oven to 375 F. In a large bowl, stir together the cocoa powder, 1/3 cup vegetable oil, eggs, and sugar until smooth. Whisk in the flour, baking powder and salt. Grease a 9x13 baking sheet with cooking oil. Spread the brownie batter in an even layer. Bake for 25-30 minutes, or until a toothpick inserted in the center comes out clean. While the brownies are baking, melt the creamy peanut butter and baking chocolate in thirty second intervals until completely melted. Gently fold the puffed rice into the melted chocolate along with one cup of marshmallows. Stir until the marshmallows have melted. Remove the brownies from the oven and spread enough mini marshmallows across the top of the hot brownies until it's mostly covered. Place the pan back into the oven for 3-5 minutes to puff up the marshmallows. Once the marshmallows are just beginning to turn golden, remove the pan from the oven. Spread the chocolate and puffed rice mixture across the top of the marshmallows, as close as you can get to the edges. Use chocolate chunks to cover any revealed marshmallows around the edges. Cool the brownies until firm, then cut into individual servings. Serve room temperature. Enjoy!